Since I can remember the first thing I would do when I would get a magazine would be to skip through to the horoscope's section to see what my month would be like. 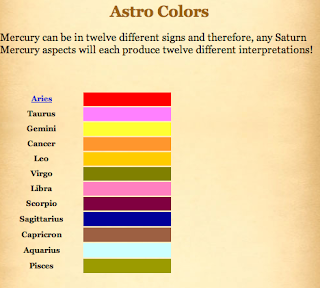 I think astrology is very interesting, and I do seem to judge peoples compatibility with me based on our star signs - although of course this doesn't always prove true (as astrology is far more complex than that and a thorough reading would require timings, place of birth etc), but it is fun nonetheless!! When Hassan Uncle heard I was fashion blogging he sent me this really interesting link about one of his newer projects. It is something I don't believe I have ever come across before, so I am quite amazed. In a nutshell it tells you about your Venus position. You can find your Venus position by entering your birthdate in the interp section on this page: http://www.astrotrends.net/venus/index. My Venus is in Virgo. 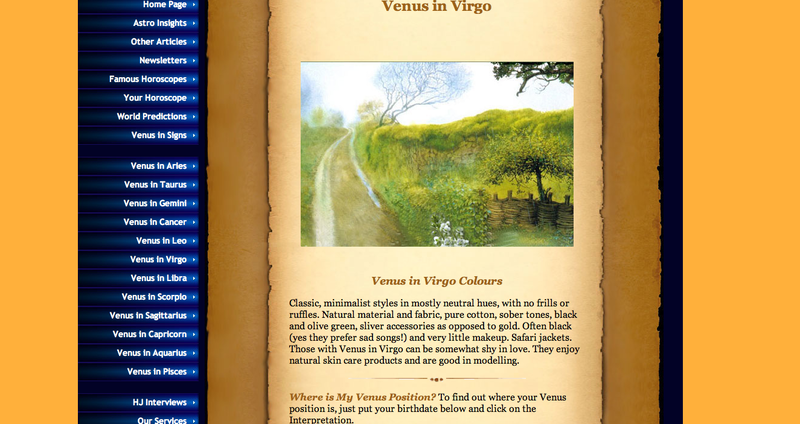 Once you find out what position your Venus is in you can then click on the menu on the left to get a summary. This summary can give you great tips as to what colour you should wear on what day and it includes style tips for both men and women. It even goes as far to say what tie colours should be worn for each Venus position. You can order a proper chart provided on the website above and also on the link below. Classic, minimalist styles in mostly neutral hues, with no frills or ruffles. 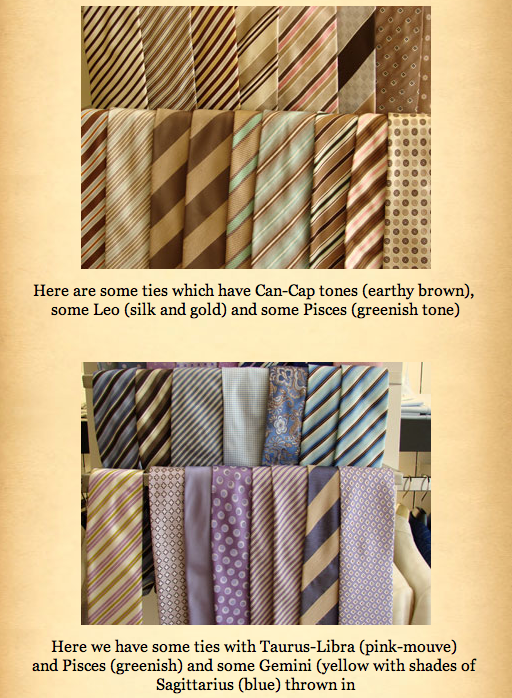 Natural material and fabric, pure cotton, sober tones, black and olive green, sliver accessories as opposed to gold. Often black (yes they prefer sad songs!) and very little makeup. Safari jackets. 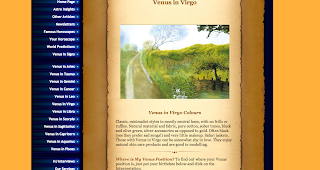 Those with Venus in Virgo can be somewhat shy in love. They enjoy natural skin care products and are good in modelling. You are very practical in most situations and have a lot of common sense. You are also quite efficient and productive but tend to worry too much, are self-critical and modest about your accomplishments. Try to change self-pity into compassion. You have a cool, scintillating quality and respond more to affection than passion. One parent usually original but erratic. You express your feelings in unemotional ways. Careful of spine and circulation problems. Manipulative but concerned for society. You are a logical, efficient, analytical and practical thinker but can be too critical. You have versatility in art, music, writing, accounting and editing but need more confidence and originality. Often singing and literary talents. Perfectionist. In love, you are very selective, critical, caring but also non- demonstrative. Once involved, you put up with a lot in relationships. Excellent for fine arts, music, dancing and any service oriented profession. You like natural materials in clothing. You are very conscious of health and nutrition, and will in fact be instrumental in making others give up any negative habits. Just make sure you are not seen as nagging others too much! Need to be careful of toxins and bladder area problems. Athletic.